JAL will revamp its domestic fleet with LED cabin lighting that changes based on season and time of day. Picture shown above is the design for spring. Image by Japan Airlines. Japan Airlines (JAL) has just announced it will expand its JAL NEW SKY PROJECT, which aims to provide a one-class above the current standard on its flights, to its domestic fleet. Currently, JAL plans to retrofit 77 of its planes which includes 777-200, 777-300, 767-300, 767-300ER, and 737-800 with the new interior based on the theme of "Superior Cabin". Domestic First Class service will be added to part of the 767-300ER fleet as well! The first rollout is planned for May 2014. Other than the cabin interior, JAL will also introduce its JAL SKY Wi-Fi service to these retrofitted planes as well. The new JAL Class J seat. Image by Japan Airlines. The current Class J seat has not changed since it was first introduced back in June 2014. After a decade, JAL will finally upgrade these seats with leather seat cover and a slightly wider seat width. According to JAL, these are the same high-quality genuine leather used for seats in luxury vehicles! So you will feel more comfortable thanks to the increased seat width and luxurious thanks to the genuine leather. However, JAL hasn't mentioned about an increase in the seat pitch, so most likely the seat pitch will remain at 95 cm (37.4 inches). The new JAL domestic Economy Class seats. Image by Japan Airlines. The Economy Class seats will also see a big improvement over the current ones. 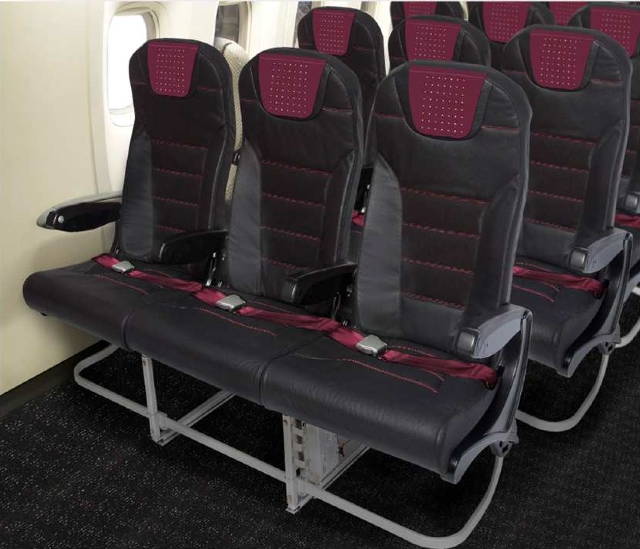 The same high-quality genuine leather used in the Class J seats will be used in the Economy Class ones. The legroom will increase by as much as 5cm thanks to the slim-style seatback design. More importantly, these all leather seats are molded after the natural contour of your back and overall body to provide significantly more comfort. JAL has went with a burgundy (or purple?) theme in the Economy Class. Event the seat belts are in burgundy! Personally I like the current color scheme more as they provide a clean and simple feeling. But I will have to see the new cabin in person to see which one I like better. 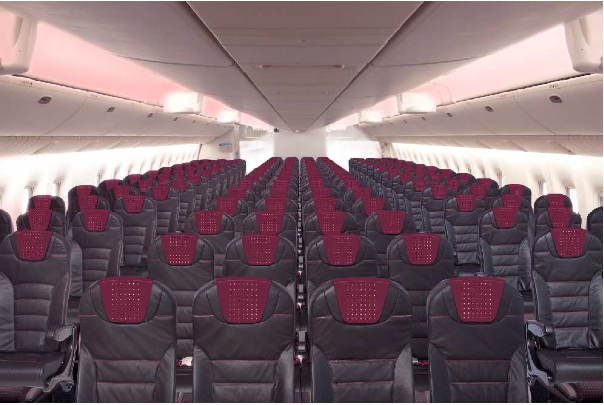 Unfortunately, JAL has not mentioned an increase in seat width and the mock up pictures also show a 10 abreast 3-4-3 configuration. LED lighting for mid-day flight. Image by Japan Airlines. 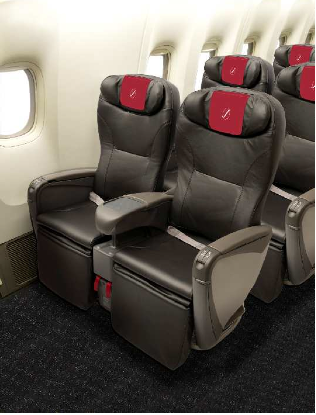 To match these new seats, JAL will also install new carpets throughout the cabin. Not sure if this applies to the Domestic First Class cabin as well given there's no new Domestic First Class seats announced (or will there be one later? :P). But LED will be installed throughout the plane to create a air-like lighting. The color will change based on flight hours, season, and natural rhythm of time to create a relaxing ambience and a feeling of Japan. JAL will expand its popular domestic First Class service to its 767-300ER fleet. Image by Japan Airlines. JAL will also expand its popular domestic First Class service to some of the 767-300ERs. Currently the domestic First Class service is only available on select flights operated with 777-200 between Tokyo Haneda and Osaka Itami, Fukuoka, Sapporo New Chitose, and Okinawa Naha. With the addition domestic First Class service on 767-300ER, JAL will be able to expand this popular service to other routes as well. 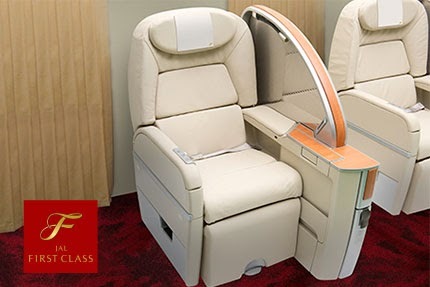 The domestic First Class on 767-300ER will have a 2-1-2 configuration with a seat pitch of 135cm. 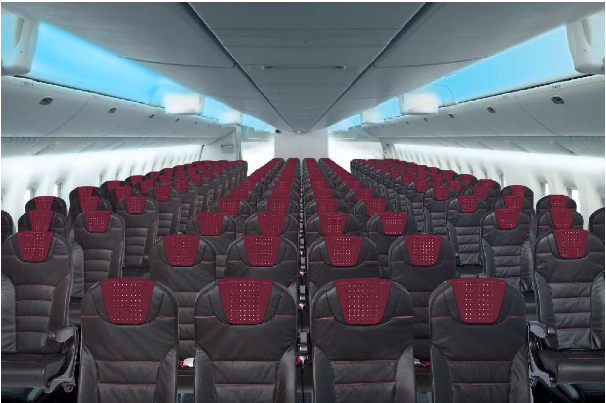 As you can see from the mock up above, the privacy divider of the middle seat is installed on the left hand side of the seat making seat A and C more private if you are traveling with a companion compared to seat H and K. Also, looks like the same carpet used in the international First Class cabin will be used in domestic First Class as well. JAL will expand its inflight wi-fi service to its domestic routes in summer 2014. Image by Japan Airlines. Currently JAL is the only Japanese carrier that provides inflight wi-fi service on its international flights. In summer 2014, JAL will be the first Japanese carrier to provide inflight wi-fi service domestically too! However, the domestic JAL SKY Wi-Fi service will be different from the international one which is satellite based provided by T-Mobile. The domestic version will be provided by Gogo, which currently is cellular tower based. However, Gogo has plans to rollout its satellite based solution using the Ku-band frequency in the future which JAL will deploy onto its domestic fleet. JAL will be one of the first airlines to use Gogo's Ku-band technology and could possibly be the launch customer (if it could beat Delta). This explains why JAL has to wait till summer 2014 to roll this out. JAL will install wi-fi equipments on the same 77 planes being retrofitted. JAL has not announced the fee for using the Domestic JAL SKY Wi-Fi yet. Currently the international service is offered at USD11.95 and USD21.95 for 1 hour and 2 hours of usage respectively. Certain JAL affiliated credit card holders enjoy a 10% discount and top tier JAL frequent flyers with a JAL Card can enjoy it for free through a credit card rebate. Most likely JAL will add a third option to cover the Tokyo Haneda - Okinawa Naha flights. According to Japanese aviation news site AviationWire, 7 777-200's, 9 777-300's, 20 767-300/300ER's, and 41 737-800's will be retrofitted. However, there's probably a typo in the article as JAL only had 7 777-300's in its fleet as of June 30 2013. But it looks like only the JAL fleet of 7 777-200's as opposed to 8 777-200's from JAS will be part of this project. This makes sense as the JAS fleet has only been recently retrofitted to the current cabin last year. As for the wi-fi rollout schedule, AviationWire says JAL plans to 34 planes equipped with Gogo equipments by end of March 2015 and the rollout will be completed by June 2016.